Guests will depart the Las Vegas Strip for a drive through the Virgin River Gorge and across Southern Utah. The tour begins with a Motorcoach trip to Kanab, Utah, surrounded by towering red sandstone cliffs. In Kanab, you will board a 14 passenger coach for the trip into Bryce Canyon National Park. 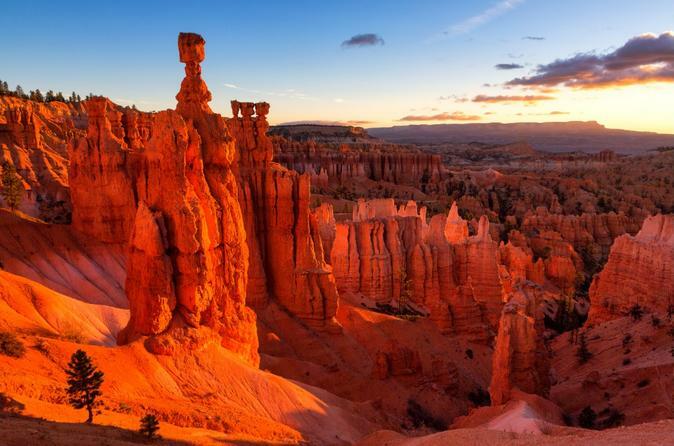 While in Bryce Canyon National Park, guests can walk the rim, shop and have amazing photo opportunities with 100 mile views. Guests can choose to walk some of the trails below the rim for other worldly scenery among the countless eroded spires and towers. Walking the trails below the rim is an option for the more adventurous!